The hardware, simply put, is anything you can touch. It comprises the physical aspects of a PBS — the bicycles, stations, docks and terminals — as well as any advertising or shelters. Although this must clearly be functional, it should also be aesthetically pleasing, as the hardware plays a crucial role in shaping the appeal of a PBS. The appearance conveys its functionality to the user in unspoken ways. It can define the system as stylish, conventional, part of the urban landscape, or something that stands out — for better or for worse. The fact that the public image of the entire system is derived to a significant extent from the look of the actual hardware, its shape, colors and association with the city and other forms of public transport, are all strategic issues during the design process, and their importance should not be underestimated. While branding will be discussed later, the durability, form and functionality of the hardware can make a system seem cool, modern and sophisticated, or anachronistic. Hardware depreciates, or gets old and needs to be replaced over time. This can occur at different rates. For example, a bicycle will probably last about three to five years, whereas docks and terminals can last up to 15 years. When making decisions about hardware and the quality required, it is useful to also link these decisions to contracting timelines: matching the operator contract timelines with the rates of hardware depreciation can help to motivate suppliers to create quality hardware and provide incentives for new operators to consider entering into contracts, as the supply of hardware often brings higher profit margins than the operations themselves do. The photographs and figures below illustrate some of the aspects of the ‘Hardware’ chapter in the book Bicycle Sharing 101: Getting the Wheels Turning. They are meant to be viewed in the context of reading that chapter. 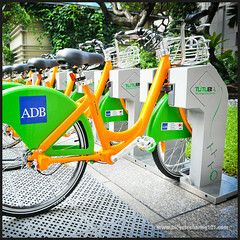 ABOVE: Bicycles in a PBS are used by everyday people who will typically be wearing normal clothing rather than cycling-specific gear. ABOVE: The rise in the handlebars promotes an upright riding position. ABOVE: Witcom, a South Korean bicycle sharing software provider, installs a screen display unit as the dashboard. This plays a watered-down terminal role as well as collects data while the bicycle is being used, transmitting it to the control center when the bicycle is docked. ABOVE: A belt-drive on a Shanghai Forever Bicycle Rental bike. ABOVE: A quick-release on the seatpost allows users to adjust seat height, but the seat cannot be completely removed by thieves. 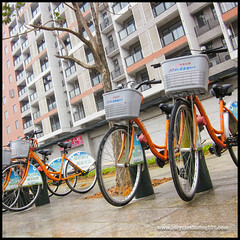 ABOVE: The sturdy front-integrated carrier of the bicycles in China’s Zhuzhou system contrast with the plastic after-market addition used in Hangzhou. ABOVE: Drum brakes, such as those in the ADB’s Tutubi system, are preferable to external ones, like those seen here in China’s Xidesheng. LEFT: While reflectors may cover the minimum requirements by law, most bicycle sharing systems utilize lights. Barclays Cycle Hire bicycles also have rear lights integrated in the seat stays. ABOVE: The chain cover on the Barclays Cycle Hire bikes offers the minimum prevention required, covering the length of the top of the chain and the front crank. ABOVE: A typical identification number on the chain stay. 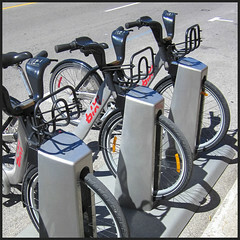 ABOVE: The two main types of dock are beam and bollard style, as seen by these in Spain’s Bicing system and Montreal’s Bixi respectively. ABOVE: Bollard-style docks at a newly constructed station in Shanghai. ABOVE: Beam-style docks at a Bicing station in Barcelona. ABOVE: This side-locking mechanism used in the PBS system of Foshan, China, is very similar to that used by JCDecaux in their Lyon and Paris systems. 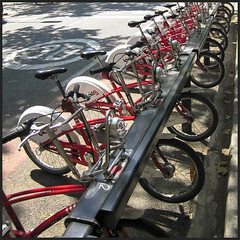 ABOVE: Barcelona’s Bicing system uses a front mount to attach the bicycle to the beam-style dock, while Barclays Cycle Hire uses a front mount to the bollard-style dock. ABOVE: Two types of secondary anti-theft locks in use in China. ABOVE: Terminals in Guangzhou and Barcelona illustrate differences in styles. ABOVE: These stations in Paris and Shanghai illustrate the philosophies of blending in versus standing out of the cityscape. The table BELOW lists some of the public and private services that can be integrated with a PBS station. ABOVE: While the bollard docks of the system in Dongguan, China, are permanently fixed to the ground, this modular station in Charlotte, U.S.A., can be removed. ABOVE: Charlotte B-cycle uses solar-powered modular stations. 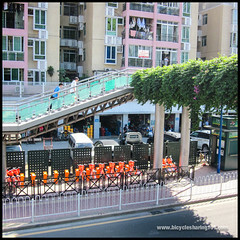 ABOVE: Orange-shirted assistants in the Guangzhou Public Bicycle System in China man some larger stations, assisting users and performing minor maintenance. ABOVE: This non-automated system in Guangzhou, China, features a kiosk and no docks. 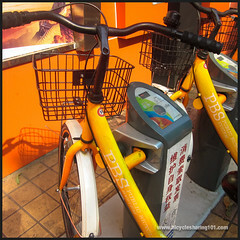 Bicycles are checked out through an attendant, either using a handheld PDA or manually. ABOVE: This station in Hangzhou, China, features an integrated kiosk and shelter.